Dgn 168b: Sc. 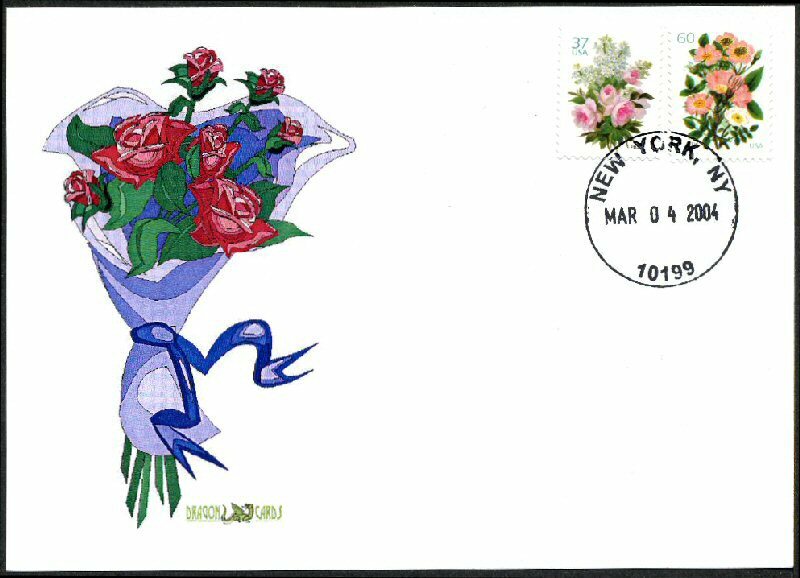 3836-7 Wedding Bouquets — Both Wedding Bouquets stamps (37¢ Garden Bouquet and 60¢ Garden Botanical) on a 5"x7" Dragon Card with a color picture of a wedding bouquet. 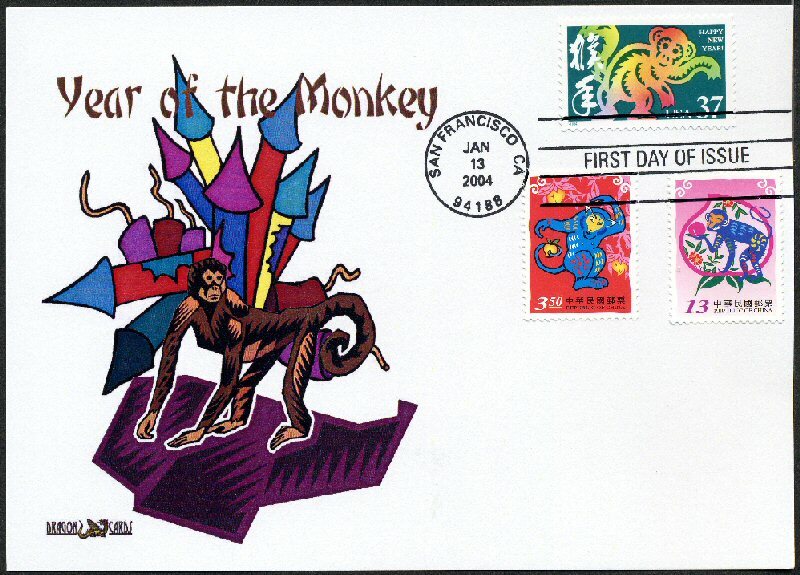 Round date hand cancel available only on day of issue (no grace period) — larger illustration (new window). Dgn 165: Sc. 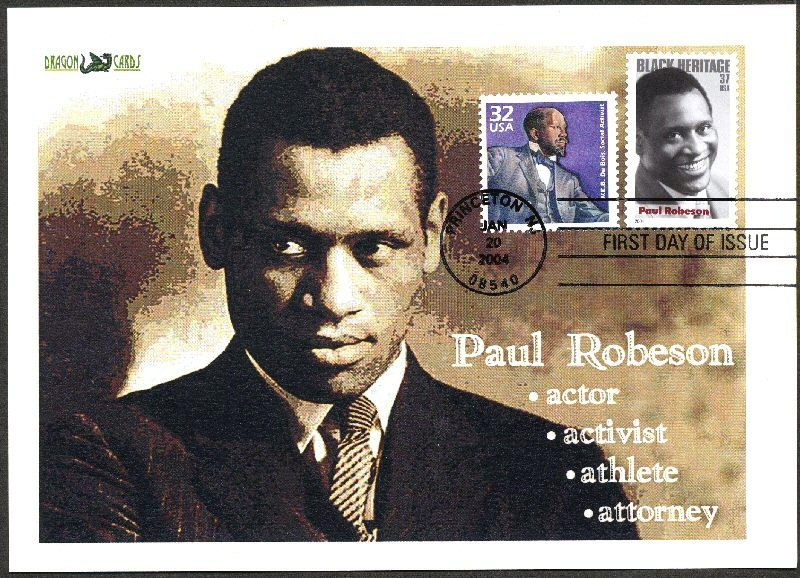 3834 Paul Robeson — 5"x7" Dragon Card with a serious portrait of Robeson, First Day of Issue hand cancel of Issue hand cancel — larger illustration (new window). Dgn 165a: Sc. 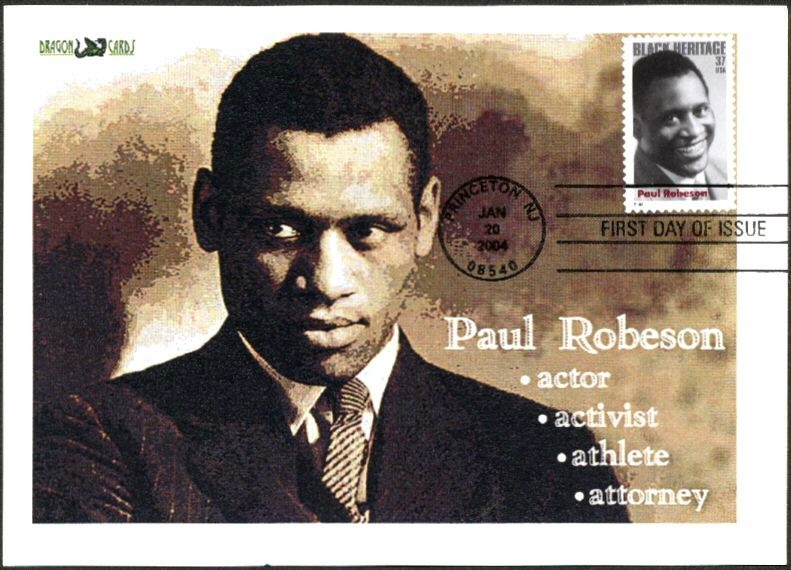 3834 Paul Robeson — 5"x7" Dragon Card with a serious portrait of Robeson, First Day of Issue hand cancel, with W.E.B. 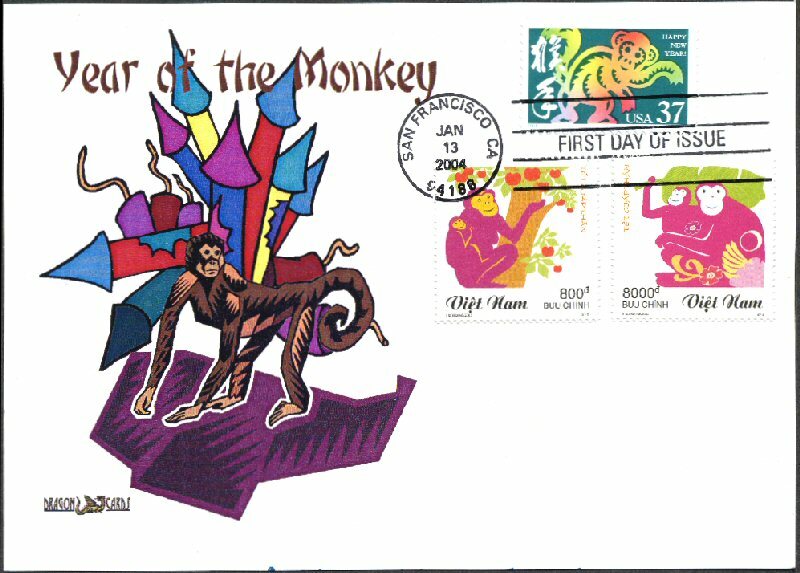 DuBois stamp from Celebrate The Century: Both ran afoul of the anti-communist fervor of the 1950s — larger illustration (new window). Dgn 165b: Sc. 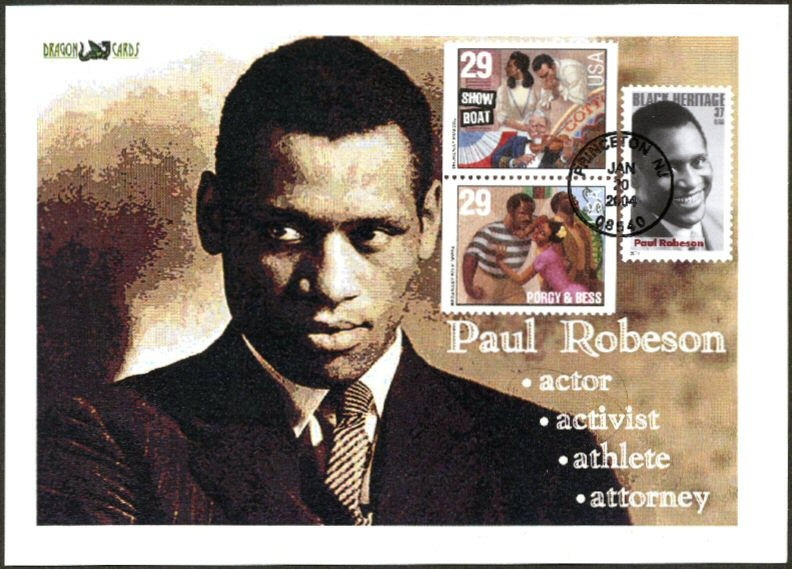 3834 Paul Robeson — 5"x7" Dragon Card with a serious portrait of Robeson, First Day of Issue hand cancel, with "Showboat" and "Porgy & Bess" stamps: He starred in both, and "Old Man River" was written for him, although he was not able to play the part until the London production -- — larger illustration (new window). Dgn 167: Sc. 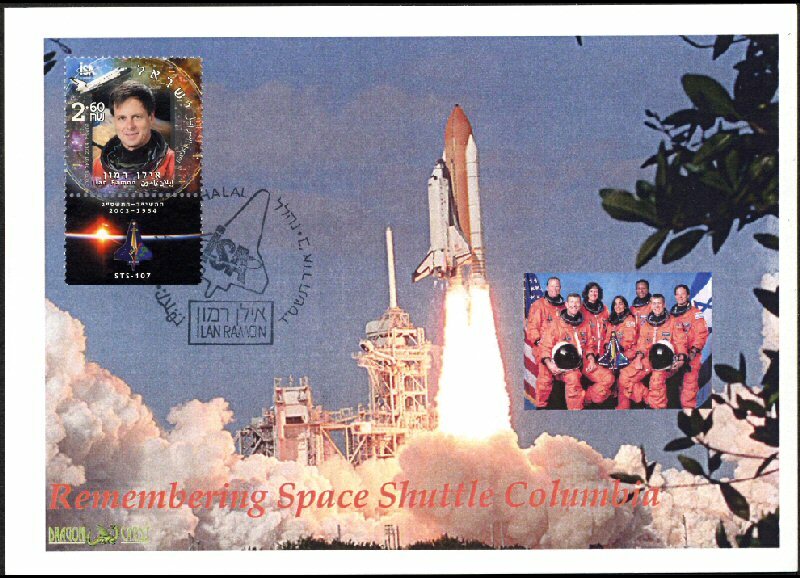 1552 Ilan Ramon/Columbia — 5"x7" Dragon Card with a color photo of Columbia's final launch, inset photo of the Columbia crew, with Israel's 2004 Ilan Ramon stamp + tab, first day cancel — larger illustration (new window). Dgn 85d: Sc. 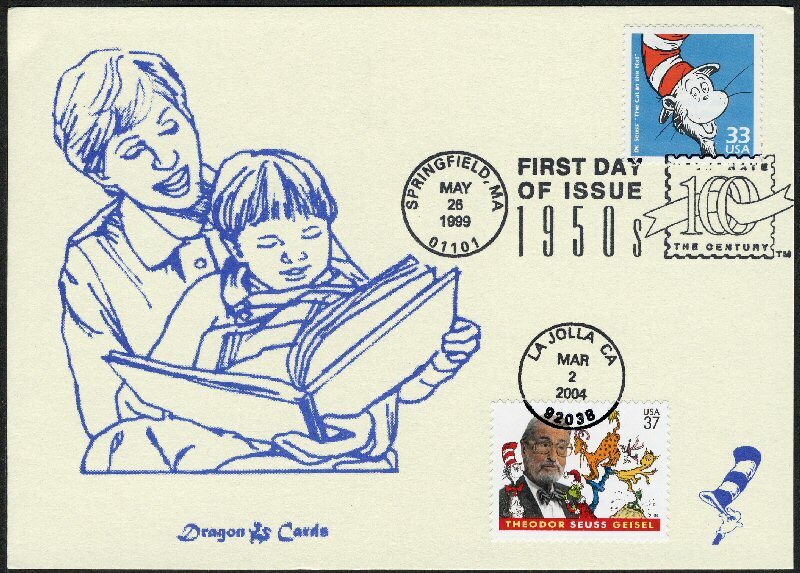 3187h/3835 Dr Seuss — single from the 1950s Celebrate the Century sheet on a blue-on-cream 5"x7" Dragon Card, drawing of mother reading to child from large-format book, with a tip of the Hat to the rights agency that would not cooperate in the lower right corner. 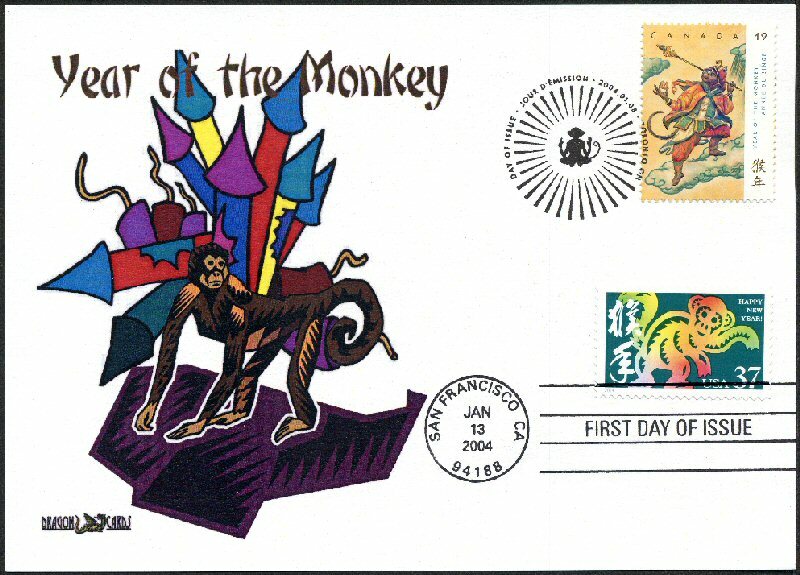 2004's Dr. Seuss stamp and its circular date stamp added — larger illustration (new window). Dgn 169: Sc. 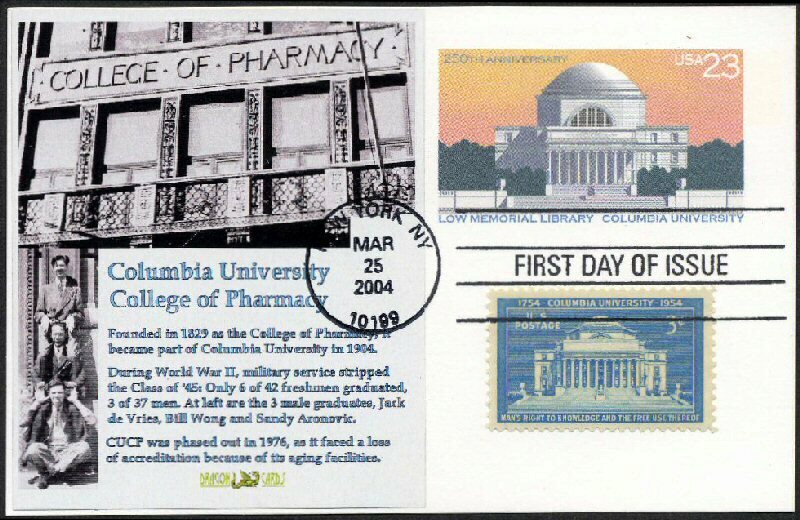 UX405 Columbia University card — postal card with Dragon Cards label cachet featuring Columbia University's now-defunct College of Pharmacy during WWII. First Day of Issue hand cancel ties cachet to the card. Just 14 produced — larger illustration (new window). Dgn 169c: Sc. 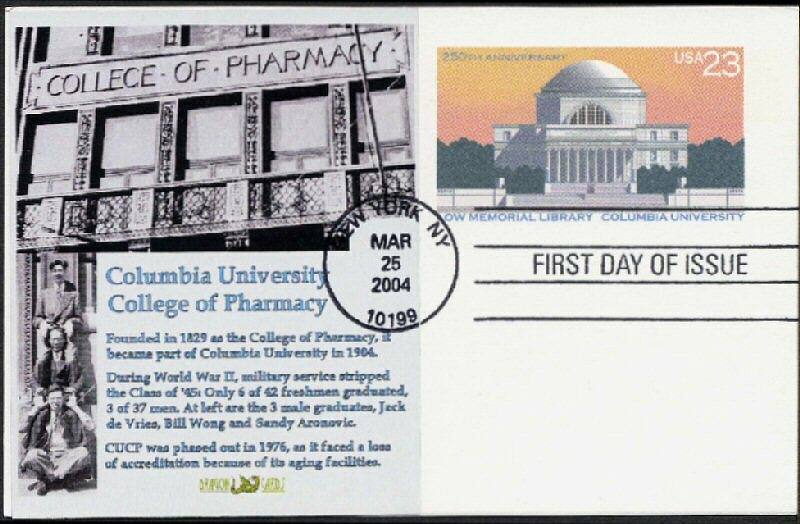 UX405 Columbia University card — postal card with Dragon Cards label cachet featuring Columbia University's now-defunct College of Pharmacy during WWII. 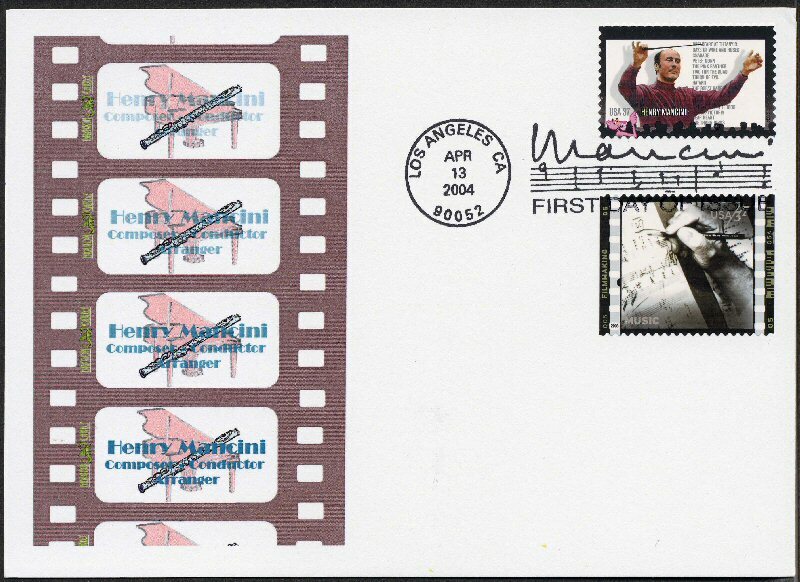 First Day of Issue hand cancel ties cachet and Sc. 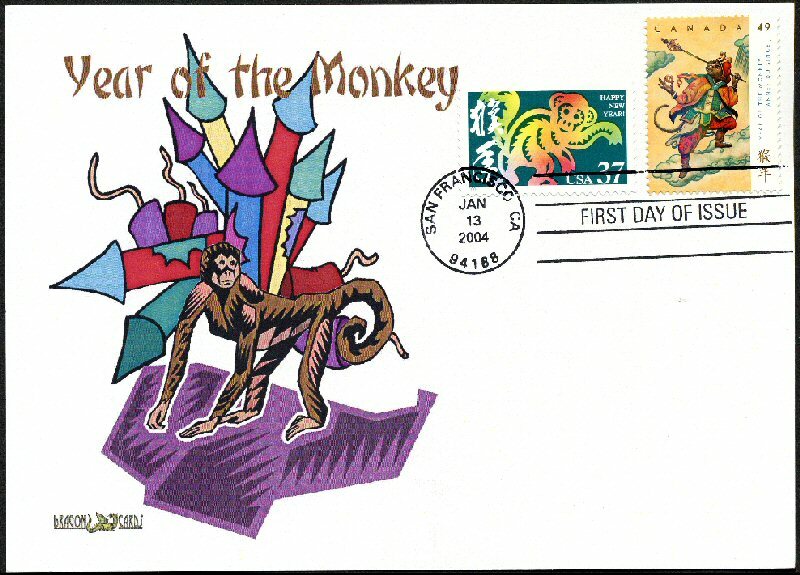 1029 Columbia University to the card. Just 10 produced — larger illustration (new window). Dgn 171: Sc. 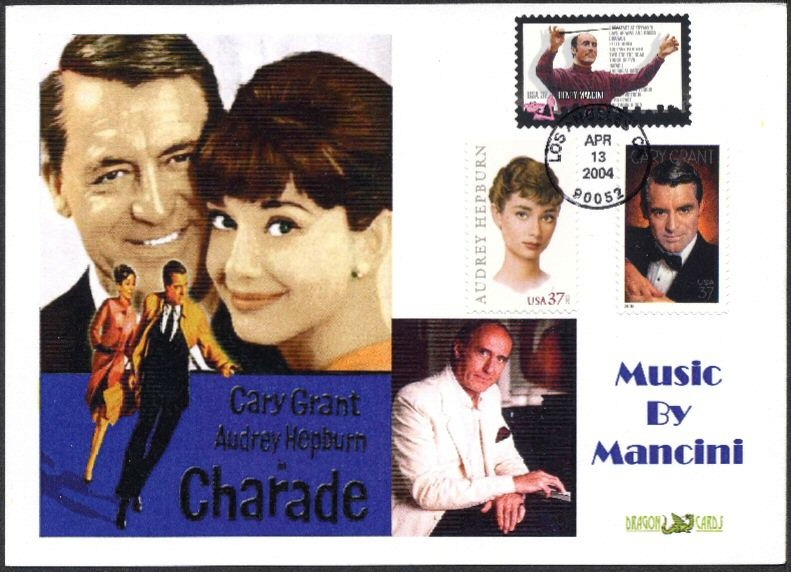 3839 Mancini/Charade — 5"x7" Dragon Card with reproduction of poster from "Charade," starring Cary Grant and Audrey Hepburn, with music by Mancini. 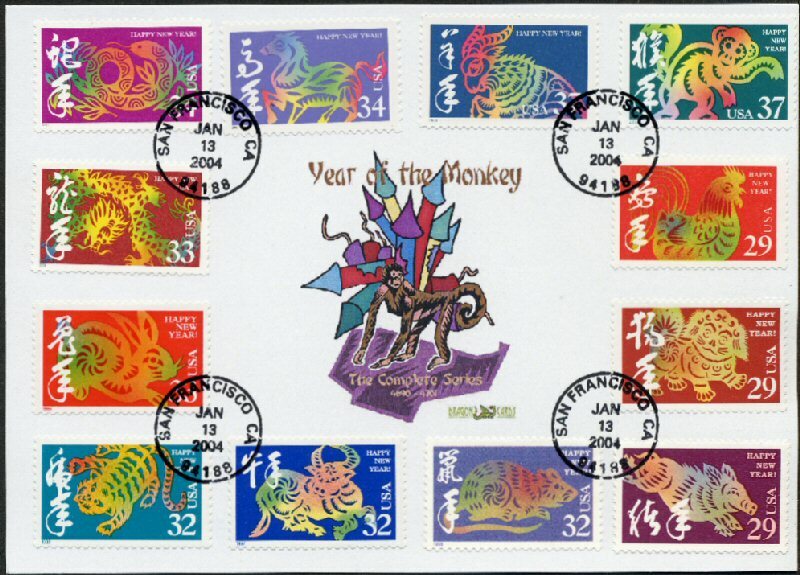 The plot revolves around rare stamps. 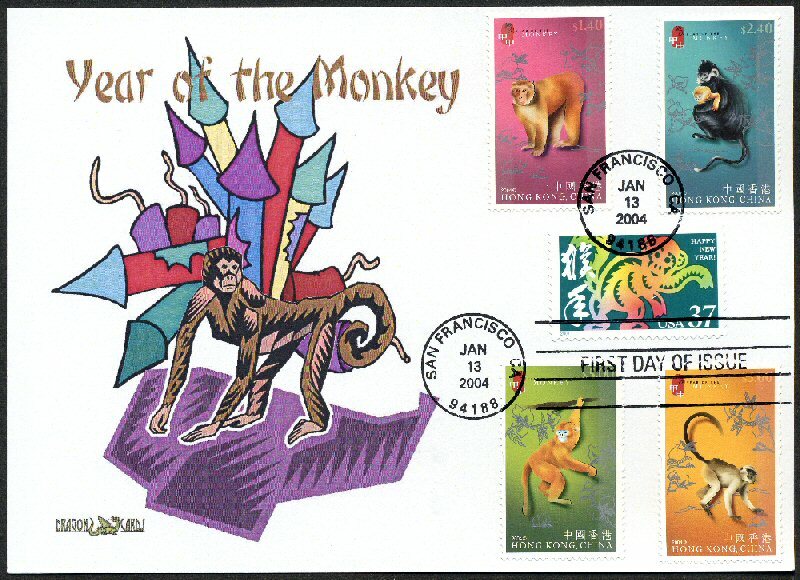 With Grant, Hepburn and Mancini stamps, First Day of Issue hand cancel — larger illustration (new window). Dgn 177ia: Sc. 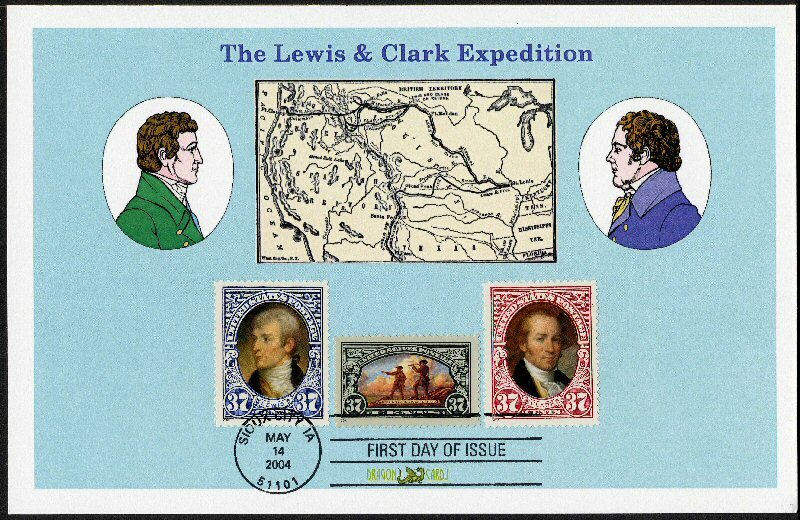 3854-6 Lewis & Clark — 5½"x8½" Dragon Cards with the two booklet stamps and one sheet stamp were serviced in all 11 cities with their respective First Day of Issue hand cancels. All sold out quickly — larger illustration (new window).